My mornings typically start off with a good cup of coffee and without it, I might as well not show up to the office. I’m definitely not the only person in this boat, just have a look at your local coffee shop in the morning, whether it’s one of those specialty coffee places or trusted coffee chains, you’ll typically see a lineup of half asleep people that look like they’re auditioning to be a zombie in Walking Dead. Since 2009, Google Trends has shown a steady increase in the number of people searching for the term ‘coffee’ on a worldwide scale and also happens to be the most searched beverage in the U.S. Judging by the number of independent coffee roasters, coffee shops and even rickshaws sporting built in espresso machines, it’s clear that people are taking advantage of this caffeinated trend. For the inclined investor looking to jump on the bandwagon, one of the questions you may want to ask is which coffee company shows continued growth potential. We’ll look to google trends to give us some hints. We compiled a list of the larger publicly traded coffee companies and took a look at their comparative search interest in North America since 2004. Starbucks clearly has the greatest internet presence out of the bunch and not only that, the search interest continues to improve showing no signs of letting up. If we were to remove searches for Starbucks, the remaining trends become much clearer. Dunkin’ Donuts and Krispy Kreme also show a positive search trend, Dunkin’ Donuts being stronger and longer in duration while the Krispy Kreme turning positive in 2009. Keurig has also shown a positive search trend till 2015 and has started to slow down. It’s worth noting that that the Keurig merger finalized in March 2016 making it a private company. We can see the positive search trends for Starbucks, and Dunkin’ Donuts are both confirmed by their revenue performance. Starbucks has seen revenues grow by 11% or more in each of the last three years while Dunkin’ Donuts growth has seen a 5% increase or more during the same time period. By order of magnitude, Starbucks has shown the most impressive growth as revenues are in the billions on an annual basis while Dunkin’ Donuts achieves slightly less revenue growth in the millions. There is something to be said about the size of Starbucks and its ability to increase revenues to such a degree and if Google Trends is any indication of what’s to come, I wouldn’t be surprised if growth continued on that pace. Is Now a Good Time to Jump Back into Oil? 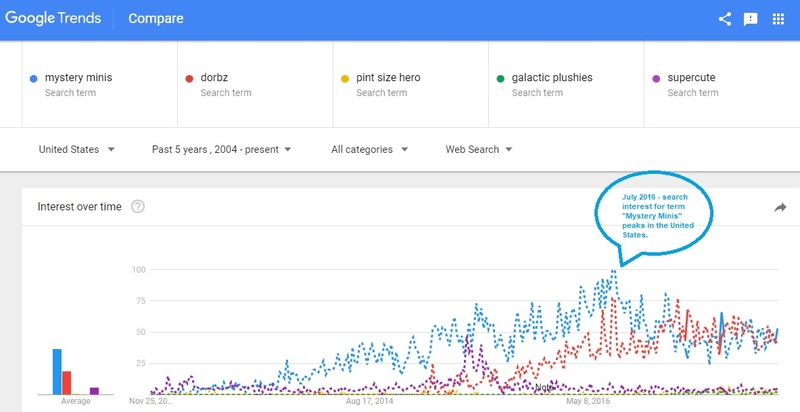 Google Trends Can Help!